Pest description and crop damage The tomato hornworm larvae is over 3 inches long when full grown, green, with eight chevron-shaped white stripes and a distinctive large "horn" on the posterior end of its body. The pupa is brown or reddish brown and up to 2.25 inches long. The adult is a large mouse-brown moth with narrow wings and a wingspan of up to 5 inches. Eggs are light green or yellow turning white at maturity. Hornworms feed on blossoms, leaves, and fruit. At high populations, they can defoliate plants extensively and scar the fruit. They are rarely a problem in the warmer interior climates unless natural enemies are disrupted. Biology and life history In late spring, the adult moth lays eggs on the underside of tomato leaves. The eggs hatch in 6 to 8 days. 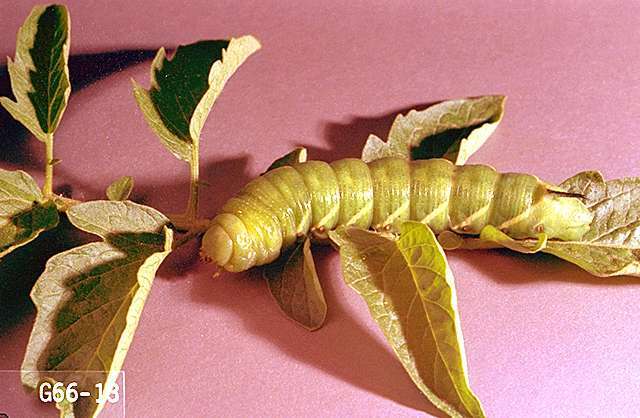 The larvae pass through five or six stages before reaching full growth in 3 to 4 weeks. The full grown larvae burrow into the soil, where they transform into the pupal stage. The hornworm remains in the pupal stage in the soil all winter until the soil begins to warm in the spring. 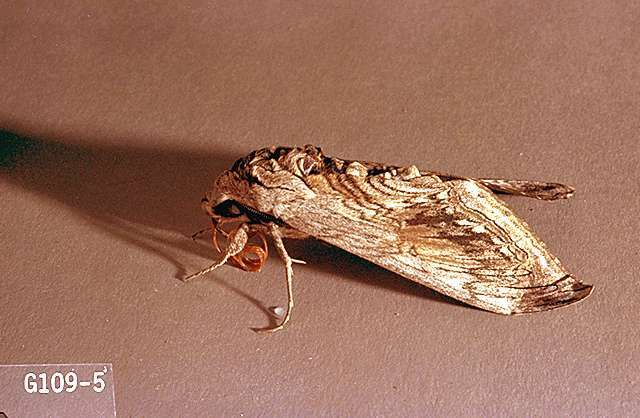 The moths emerge from the soil in the spring and mate. The females begin to deposit eggs on the tomato plants for the next brood of hornworms. Pest monitoring Treat hornworms only if they are causing extensive foliage damage, or if they are feeding on fruits. Look for the presence of hornworms on the plant as you sample to determine if damage is the result of hornworm or armyworm activity. Hornworm feeding produces larger, deeper cavities than those caused by beet armyworm. There are several important, naturally occurring parasites that help control hornworms in tomatoes. Conserving these parasites by not treating with disruptive pesticides, particularly early in the year before fruit begin to mature, is the preferred management approach. Home gardeners: Hand-pick hornworm larvae. chlorantraniliprole (Coragen) at 0.026 to 0.098 lb ai/a foliar; 0.045 to 0.098 lb ai/a drip chemigation. PHI 1 day. REI 4 hr. Do not exceed 0.2 lb ai/a per season. Retreatment interval 5 days for foliar and 10 days for chemigation. chlorantraniliprole/lambda-cyhalothrin (Voliam Xpress) at 0.049 to 0.088 lb ai/a. PHI 5 days. REI 24 hr. Retreatment interval 5 days. Do not exceed 0.36 lb. ai of lambda-cyhalothrin or 0.2 lb. ai of chlorantraniliprole per acre per growing season. cryolite (Kryocide) at 7.7 to 15.4 lb ai/a. PHI 14 days. REI 12 hr. OMRI-listed for organic use. cyfluthrin (Tombstone) at 0.025 to 0.044 lb ai/a. PHI 0 days. REI 12 hr. Retreatment interval 7 days. Do not exceed 0.263 lb ai/a per season. esfenvalerate (Asana XL) at 0.015 to 0.03 lb ai/a. PHI 1 day. REI 12 hr. Do not exceed 0.5 lb ai/a per season. Do not graze. gamma-cyhalothrin (Declare) at 0.008 to 0.015 lb ai/a. PHI 5 days. REI 24 hr. Retreatment interval 5 days. Do not exceed 0.18 lb ai/a per season. indoxacarb (Avaunt) at 0.045 to 0.065 lb ai/a. PHI 3 days. REI 12 hr. Retreatment interval 5 days. An adjuvant improves control. Do not exceed 0.26 lb ai/a per season. Insect feeding stops soon after application, but 3 to 4 days are required for maximum effect. lambda-cyhalothrin (Warrior II) at 0.015 to 0.025 lb ai/a. PHI 5 days. REI 24 hr. Retreatment interval 5 days. Do not exceed 0.36 lb ai/a per season. methomyl (Lannate) at 0.45 to 0.9 lb ai/a. PHI 1 day. REI 48 hr. Do not exceed 6.3 lb ai/a per season. methoxyfenozide (Intrepid 2F) at 0.06 to 0.12 lb ai/a (early-season) or 0.12 to 0.25 lb ai/a (mid- to late-season). PHI 1 day. REI 4 hr. Do not exceed 1 lb ai/a per season. permethrin (Loveland Permethrin) at 0.05 to 0.2 lb ai/a. PHI 0 days. REI 12 hr. Retreatment interval 7 days. Do not exceed 0.6 lb ai/a per season. spinetoram (Radiant SC) at 0.039 to 0.078 lb ai/a. PHI 1 day. REI 4 hr. Retreatment interval 4 days. Do not exceed 0.266 lb ai/a per season. Limit 6 treatment per season. Do not apply to seedling fruiting vegetables grown for transplant within a greenhouse, shade house, or field plot. tebufenozide (Confirm 2F) at 0.09 to 0.12 lb ai/a early-year, or 0.12 to 0.25 lb ai/a mid- to late-year. PHI 7 days. REI 4 hr. Do not exceed 1 lb ai/a per season.